From a workout to a work of art in 3.1 miles! 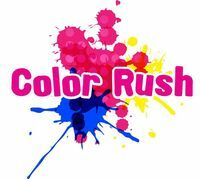 Color Rush is the primary fundraiser to support United Way of Chelan & Douglas Counties' Youth United program. Participants start out in a bright, white t-shirt, then at approximately every kilometer, they get blasted with a different colored vibrant powder. By the time they return, they look like a Skittles employee! Then, at the end of the run, they are given another packet of color so they can participate in the final color blast at the end of the run. This is a fantastic, family-friendly event with photo opportunities and memories to keep for a lifetime! Youth United is a program that encourages teens in grades 6-12 to volunteer and then recognizes their contributions with a Varsity Letter (high school) or a Service Medal (Middle School). It is a fantastic way to get our valley's youth engaged in their community and its needs while creating a greater sense of self worth as a contributing citizen. Additionally, it helps our valley's youth build amazing resumes for their future college and college scholarship opportunities. This fun run begins at Pybus Market on Worthen street in Wenatchee, Washington and runs along the riverfront park on Riverside Drive and finishes up in Gold's Gym parking lot. Packet pick-up will be inside Pybus Market on Saturday, August 20th from 4-7 PM and again immediately before the run on Sunday. T-shirts are included with your registration, but if you have sensitive eyes or do not want to breathe the powder (it's corn starch), we recommend some safety items such as safety glasses, sunglasses and a bandana to cover your mouth and nose. These items can be purchased in our Color Rush store if you need them.